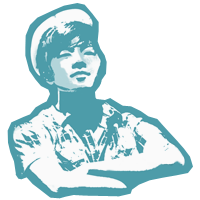 Inspired by the French phrase - C'est Bon which means "it's good", Saybons started with an objective to make authentic French classics fuss-free, yet affordable and accessible. Bromance ZR, Brother Tim and I were deciding on our makan place after church service, when I suggested having a cup of hot classic French soup and some savoury crepes at Saybons. 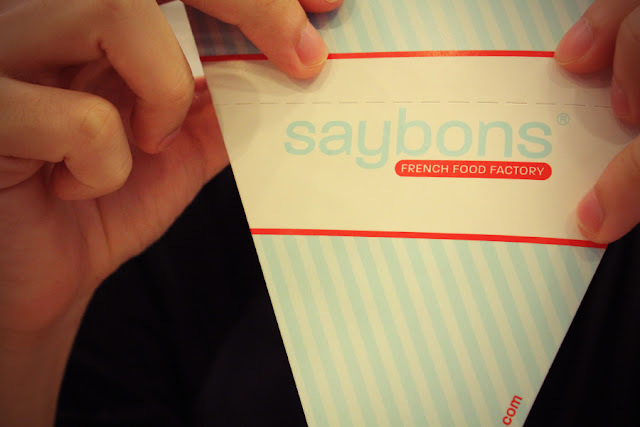 Talking about those mouth-watering crepes, Saybons probably serves one of the best (and yet wallet-friendly) in Singapore. 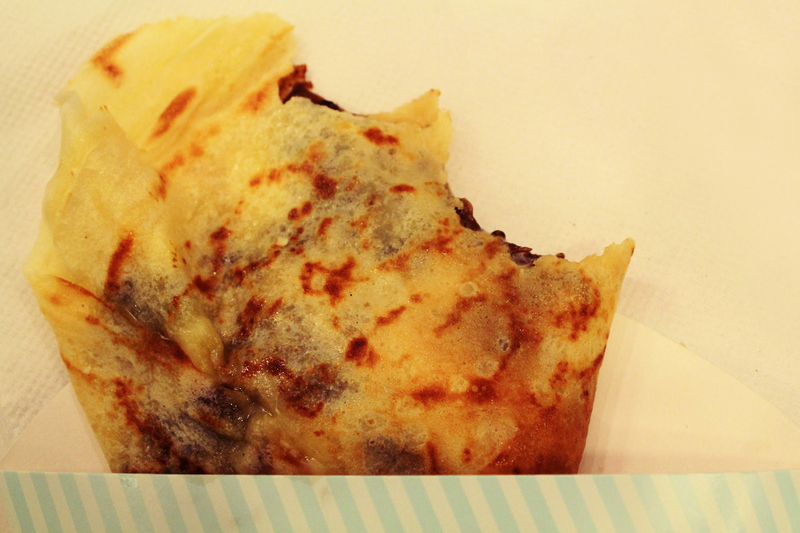 These waffle-thin pancakes (prices range between S$3 - $5) are made using a French-style secret recipe, consisting of just the right amount of batter and, tasted light and buttery, paired with their wide range of sweet or savoury ingredients - one huge YUM. I also love how they make it chewy but with a slight crisp on the edges. And for convenience sake, these crepes are served in a paper pocket.. Better to enjoy it while it's piping hot! We also had a variety of classic French soups (from right) Potato & Leek, Wild Mushroom and Fresh Tomato. Using only the freshest food ingredients, these delectable soups are a healthy alternative to your usual artificial drinks or "as a delicious complement to your regular meal." They also take pride in their traditional French cooking techniques, resulting in a refined, smooth texture with no irregular bits or chunks in the soups. 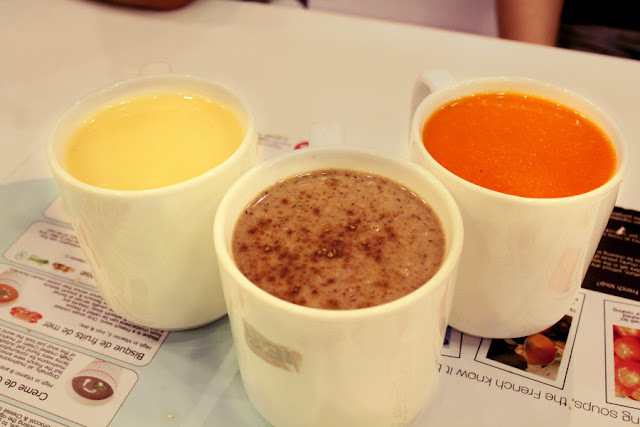 One can even (or rather, the proper technique is to) drink the 8oz soup without any soup spoon, instead sip it as if you are drinking coffee or tea. Still filling hungry? They also serve other affordable French dishes, such as breads, salads and a variety of escargots as well. 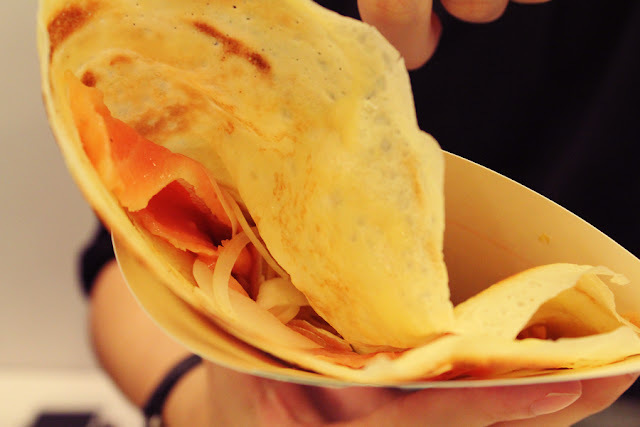 You can even design your own crepe, with more than 10 toppings to choose from.